CSUN political science student Justin Clark, 19, ran a respectable campaign for District 45’s State Assembly race. Photo courtesy of Justin Clark. The 2018 California’s 45th Assembly District race in the general election was met with an unlikely candidate: Justin Clark, 19, a junior political science major at California State University, Northridge, threw his hat into the ring. Clark proved his capability on the campaign trail. 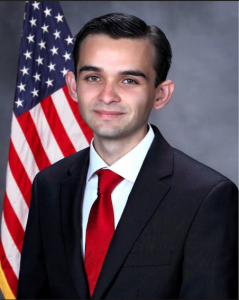 Clark, a Calabasas native, decided in his senior year at Calabasas High that he could run a competitive campaign in the district then represented by Matt Dababneh. It would be a full three years before Clark actualized his campaign, eventually running against Gabriel, who had taken over in a June 2018 special election after Dababneh resigned. Clark had an early fascination with politics, which sprung from conversations with his father, Michael Clark. His dad never told him what to believe, Justin Clark said, but asked why he believed it. Clark credits these conversations at home with helping him learn how to avoid regurgitate talking points, and do the research to understand an issue. After high school, Clark enrolled at CSUN, majoring in political science. To help pay for expenses, he works as a shift leader at Jeni’s Splendid Ice Creams ​located in Calabasas. His biggest challenge, he said, was balancing a full-time class load, part-time job and strong political aspirations. This led him to make the decision to take the 2018 fall semester off to work on his campaign. As a self-described libertarian, Clark says he is socially liberal, but fiscally conservative. His platform stances varied from naturally more conservative stances such as border security and government spending to more liberal stances such as affordable education and infrastructure spending. As a Republican in Democratic-leaning Southern California, he understood it would be an uphill battle. On June 5, 2018, Clark secured the republican nomination in the primaries, garnering 31.9 percent of the vote. While Gabriel was his primary opponent in the general election, others in the race included: Democrats Tricia Robbins Kasson, Ankur Patel, Jeff Bornstein, Daniel Brin and Ray Bishop. Clark’s campaign team consisted of 15 people and a $15,000 budget, a fraction of the money raised by his Democratic competitor Gabriel, who had raised about $1.6 million, according to Voter’s Edge, a nonpartisan election research organization. Clark says that the fundraising disparity between Gabriel and him was the biggest challenge in the race to overcome. The most significant contribution and endorsement to Clark’s campaign was from the Los Angeles Police Protective League (LAPPL), a union dedicated to protecting, promoting and improving the working conditions, legal rights, compensation and benefits of Los Angeles police officers. Before giving their support to Clark, the LAPPL vetted him to make sure he was a competent candidate. Clark’s team of volunteers consisted of friends, family and other supporters. Every two weeks, Clark would participate in six to 10 campaign events, including debates, while going door to door to gain support from voters. On election night, Clark threw a party to celebrate the hard work his volunteers and supporters. Clark said that the results were expected based on pre-election polls, However, it was his goal that an alternate voice was heard and other ideas were presented to the public. The next morning, Clark called Gabriel to congratulate him on his victory. Clark plans to finish his bachelor’s degree in political science at CSUN and take the time to focus on himself. He said he’s still fascinated in politics and while it might not be running for office, he wants to stay involved anyway he can.